On a July day in 2001, in drizzle and early morning fog, a SOO Lines caboose rose out of St. Johnsbury on its final trip. Rusted on the outside, graffitied inside and out, the caboose repeatedly crossed a railbed as it twisted and turned up through Danville. After Joe’s Pond, the rail line, now turned snowmobile corridor, headed into Walden, the caboose’s final destination. Once, passage of a caboose had meant that the train was done. Now, a caboose rolling on rails was akin to a time machine. The railroad from St. Johnsbury to Swanton had opened in 1871. It operated under many owners and many names, including Portland and Ogdensburg, Maine Central, Lamoille County, Vermont Northern, and Twin State. The Walden station was built in 1874, at Walden Heights, named because it came at the summit of a difficult grade. Stages would meet passengers for rides to Noyesville, South Walden, and Cabot. Frank Taylor of South Walden drove a wagon festooned with a black and orange umbrella. After he was “saved”, he always felt a duty to preach a sermon of ten minutes or so at the station, even in the absence of an audience. The station was torn down in 1954, long after the last sermon. After cutting through a corner of Hardwick, the line ran through East Hardwick, then did a 270-degree curve in Greensboro Bend that allowed it to follow the Lamoille River Valley. This was the source of its last name, the Lamoille Valley Railroad. As of the summer of 2003, the state awaited word from Washington on whether it could give up its interest in the route to allow it to be converted to a recreational trail. The railbed would then link with the Missisquoi Valley Rail Trail in Sheldon Junction. In converting to a recreational trail, Vermont would be “banking” the miles, which would retain the option of returning them to railroad usage. Ignominiously, SOO caboose 143 rode on a flatbed trailer, without the wheels, called trucks, on which it had rested the previous day. The trucks awaited on a pair of rails at Coles Pond in Walden. A crane had lifted the body off the trucks the previous night. All that had kept the body attached to each truck was a free spinning metal pin, plus the effect of gravity. Examination of the pins had shown that one was badly bent. That, along with the dents in one corner of the body and a mangled staircase, confirmed that SOO 143 had been off the rails at least once in its working life, albeit accidentally. Because the graffiti prominently displayed the name IRENE at both ends, the caboose had received the name Irene SOO upon its arrival in St. Johnsbury. Irene SOO had begun her service in 1973, working in the upper Midwest. Midwestern origins were evident in the graffiti “muskies are evil, catch and kill.” Graffiti on the inside directed classic labor disdain at management and celebrated the use of recreational pharmaceuticals. Irene SOO’s disrepair paralleled that of the American railroad system at the beginning of the twenty-first century. Railroads had been the predominant method of shipping and long distance travel at the beginning of the previous century. When railroads reached their peak just before the Depression, there were over 34,000 cabooses in service. By the time Irene SOO retired, a government-built network of highways, like the one starting her on her last trip, dwarfed the remaining railroad mileage. The SOO Line itself had been acquired in 1990 by Canadian Pacific, one of two dominant lines in Canada, which also ran into the United States. Irene SOO was one of 42 cabooses still in Canadian Pacific service at her retirement. Technology led to the demise of cabooses. Bigger engines led to longer freights, which reduced the number of cabooses needed. Signaling and communication improvements eliminated the need for the men in the vulnerable car at the back of the train. Paperwork, which had taken over half the conductor’s time, was greatly reduced by computers. Detectors along the trackside could signal the failure of a wheel bearing or dragging equipment. Railroads classified cabooses as non-revenue producing equipment. 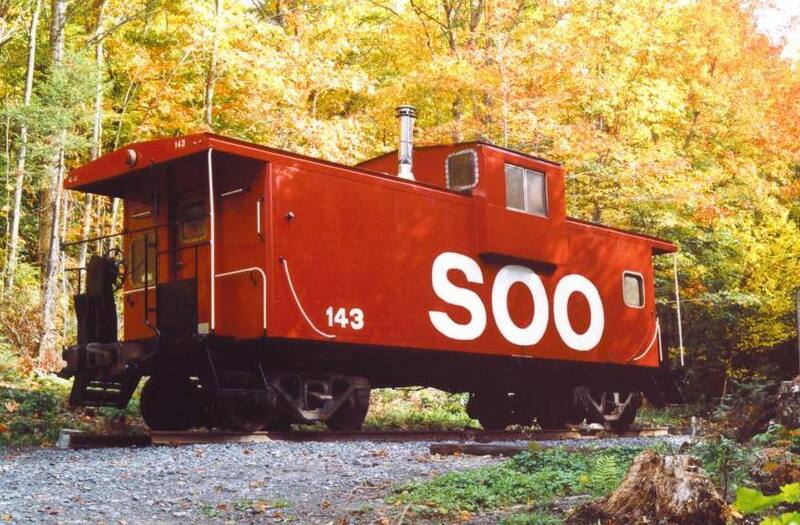 As late as the 1980’s, the SOO Line would allow a single passenger to purchase a ticket to ride in the caboose on some trains. One line estimated that the annual cost of running a caboose was $36,000. The few cabooses being built in the early Eighties cost around $80,000, so that passenger revenue wasn’t going to offset the cost of replacing aging cabooses. Ultimately, labor agreements were signed to allow for the elimination of cabooses. When the end came, it was like an asteroid strike decimating the dinosaurs- cabooses disappeared en masse in 1984 and 1985. While some cabooses worked long hauls through the mid-Nineties, now, the number of cabooses in service nationwide is probably in the dozens, mostly on work details, yard work or for special trains. The bad news is, if a short train with a caboose on the end passes through your neighborhood, that it may be carrying hazardous materials. The crewman waving from the back platform was replaced by FRED (Flashing Rear End Device) or ETD (End of Train Device). When the author’s Internet auction bid was accepted, Canadian Pacific transported the caboose from Chicago over its tracks to a yard outside Montreal. Freight tracking made it possible to follow her journey by Internet, including a long stop in St. Paul, where spring floods delayed the trip. 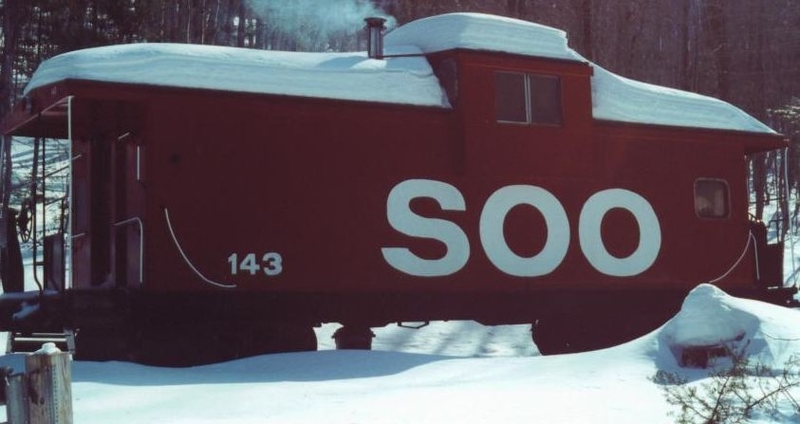 Outside Montreal, the caboose was picked up by the Northern Vermont Railroad, itself in bankruptcy at the time, and in the process of being sold and renamed. While Irene SOO sat awaiting her ride up the hills, the new owners scrubbed at dirt and soot. By the 1950’s, crews were no longer assigned cabooses over long hauls. Therefore, no one had taken a proprietary interest in her cleanliness. As diesel replaced steam locomotives, coal-burning stoves had been replaced by oil. The now-removed oil burning stove had layered the interior with soot and grime appropriate to railroad history. The plywood floor had been recipient of spilled oil on many occasions. Electricity in modern cabooses was provided by an alternator/generator linked to an axle by a pulley. When the train wasn’t moving, a common state for a freight, electricity was released from storage batteries in a cabinet. Leaking batteries had made that cabinet a chemistry experiment lying in wait. Large amounts of baking soda were added until no more fizzing was observed. Because rail yards tended to be in the worst of urban neighborhoods, federal regulations had required railroads to put bulletproof glass in cabooses. Railroads went further and put plate steel over windows that looked out to the side, since they could hardly be used to observe the train. Irene SOO’s windows were uncovered and cleaned for the first time in untold years. Leaving St. Johnsbury, her interior was cleaner and brighter. Estimates on sandblasting the rusty exterior proved equal to the purchase cost. Fortunately, the owners found a rust encapsulating paint that was designed to seal such oxide coatings. So it was a slightly prettified Irene SOO that was driven off the pavement of Route 15 onto dirt roads in Walden, slowing to a crawl at low hanging lines. The truck headed down the last dirt road alongside Coles Pond with the crane behind it. Neighbors joined the slow procession to the final site. There, the crane swung the body over two temporary rails onto which the trucks were to be rolled. The proud new owner stood in the drizzle before all the neighbors, stabilizing the body so it would no longer rotate as it hung suspended. The crane workers were to slowly roll the first truck to its location under the body, stopping it by putting a large chain across the rail in its path. The massive truck proceeded down the rail, built momentum, hit the chain, rolled over it, and kept on going. The new owner contemplated for a nanosecond the possibility of stopping the truck by leaning into it, then chose to play matador instead. So Irene SOO, a few scant feet from her final destination, had derailed one last time. At that point, the drizzle became a downpour and workers all turned befuddled looks upon one another. Onlookers sought the shelter of their homes. What followed was the classic problem solving of engineering. Another strap was attached from the crane to the truck. Slowly, both the body and the truck swung over the two permanent rails. The operator didn’t let anyone know until afterward that the back of the crane was close to lifting off the ground as he pushed its limits. The body was lowered onto the two trucks. The new owners rode on the platform as the crane centered the caboose on the tracks. The big chain was locked around the rail so the caboose could never roll again. Irene SOO had come home. Over the next few weeks, the interior and exterior were painted, and beds were built for the cupola. A new chimney was put in with a woodstove and carpets and furniture were picked out and installed. The bunkhouse named Irene SOO had been saved from the scrap heap. Having spent her career at the end of the train, she was now at the end of the line.